Enjoy good music, meet your peers, support your locals and have a drink with us! 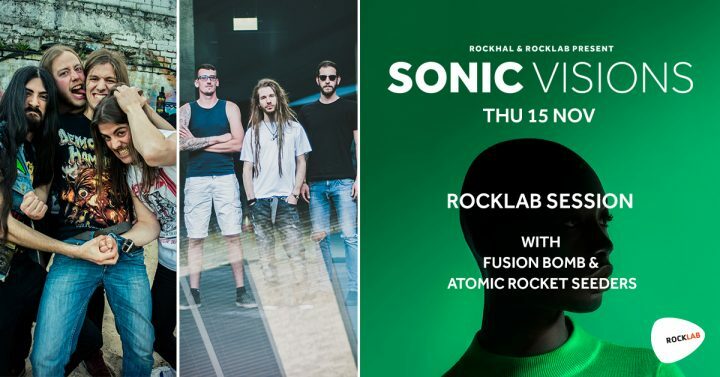 For this dedicated showcases, Rocklab is happy to have two promising local metal acts on board: Fusion Bomb and Atomic Rocket Seeders, both rehearsing at Rocklab and ready to share their thrilling material with the audience. Free entry! Local trashers Fusion Bomb are no strangers anymore when it comes to the local metal scene, playing Oldschool Thrash Metal infused with a hint of American Crossover. Released in 2016, their EP Pravda was well received by critics and enabled them to share the stages with bands like Megadeth, Tankard or Dust Bolt. Currently touring the eastern borders of Europe, the band is willing to give a foretaste of their new album, which will be released at Rockhal in January. Atomic Rocket Seeders is a three-piece band incorporating a diversity of genres such as Metal, Blues, 70s Hard Rock or Jazz. Surprising the crowd with their fresh blend of musical styles, Atomic Rocket Seeders have won this year’s Metal Battle at the Kulturfabrik, granting them a slot at the notorious Wacken Open Air Metal Festival this summer. Furthermore, the band recently released a three track EP and is currently planning a tour in England and the Ukraine.